In his latest work, In Residence 6, composer, sound artist and designer Yann Novak explores the subtle but highly emotive relationship between sound, narrative, and location. 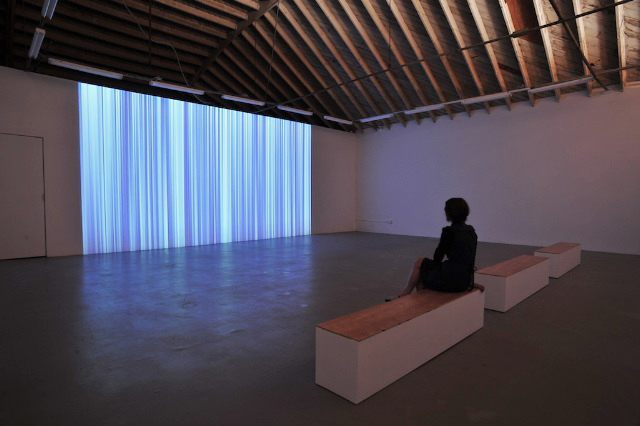 The installation takes the form of a 4.1 channel audio piece with speakers distributed throughout the gallery and a single channel video accompaniment projected in large format onto the gallery’s vast wall. Specifically coinciding and contrasting with L.A.’s drought-ridden and hottest summer months, In Residence 6 focuses on the rain-soaked month Novak spent at the Espy Foundation artist residency in Oysterville, Washington in the fall of 2007. Taking on the steady drone of the constant rain as its point of departure, the installation explores the artist’s response to this prolonged period of rain through the construction of an emotive auditory environment that is melancholic and meditative. While never dictating emotion, Novak creates a minimalist representation of his response to feeling trapped in the damp and flooded landscape, translating the literal to the romantic and visceral. In the project space, Juliana Paciulli is debuting a new triptych that explores themes of absurdity, self-awareness and sensory perception. Sensors grew out of her earlier The Girl Who Knew Too Much series, a group of essentially quotidian images which utilize rich visual detail to address the coded meanings inherent in popular media’s portrayal of feminine iconography. Juliana Paciulli has been included in several recent solo and group exhibitions. A selection includes Personal Lives, Verge Gallery, Sacramento (2009); The Still Life Show, Mile Post 5, Portland (2009); The Magical Mundane, Bucket Rider Gallery, Chicago (2007); Show, Jail, Los Angeles (2007); The Girl Who Knew Too Much, Episode II, Black Dragon Society, Los Angeles (2005) and The Girl Who Knew Too Much, Lucky Tackle Gallery, Oakland (2004). Her video portrait of a young girl’s fascination with Jim Morrison is currently featured at the Martos Gallery in New York. Paciulli was born in Manassas, Virginia and lives and works in Los Angeles.